This is one of the best animal stories for children. Once upon a time, in a forest was a lovely pond. This pond was situated in the heart of the forest. Around the tree, grew tall grass and many flowering plants. In the pond, lived many frogs. Now, the frogs lived happily. But they could not agree on only one thing. They could not decide who their chief would be. Most of their days were spent croaking and fighting about who will be the next chief. Also read, The Lion And The Frog Story. Image Source @ wordpress.com. “I will be the next chief,” croaked one of them. Then another would croak, “No! It is me who should be the chief and not you!” Three of the frogs were of the opinion that only they alone should be the chief. And because of this, they did not have a chief. They croaked and croaked, but never came to a definite decision. Then one day, a long legged crane came to the pond. The crane was quite hungry. All the croaking frogs caught the crane’s attention. Now, the crane set its eyes on one of the frogs that had been saying that he should be the chief. The frog gave a frightened croak the moment the crane caught it with its beak. The frog tried to escape but could not. The moment the crane was about to eat the frog, it felt a slimy thing around its leg. “Oh,” sighed the crane. “I’ll have to let this frog go.” The moment the crane loosened its jaw, the frog leaped away. That afternoon, the crane ate the snake for its lunch. Also, read The Frog Whose Belly Burst. In the evening, the crane could still hear the frogs arguing about who should be the chief. But the frog that had been caught by the crane remained silent. The crane set its eyes on the fatter one of the two. But before the crane could gobble the fat frog, the crane saw something that let the frog escape. Now, the same evening, the crane was still around and was still hungry. And the two frogs that had encountered the crane did not say anything. 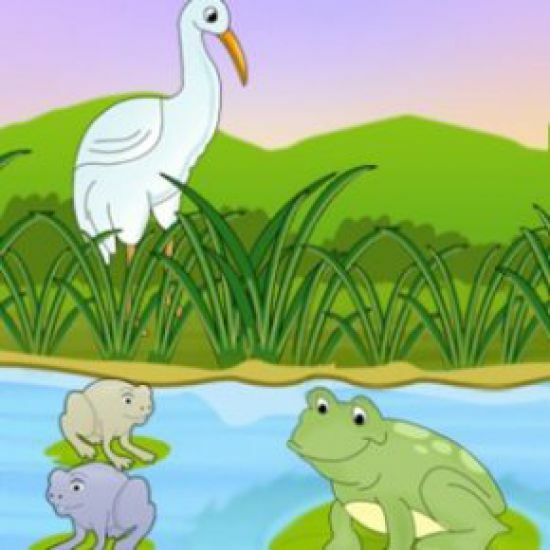 But the third frog still said, “I should be the chief!” And this time, the crane quietly crept behind the frog and ate the noisy frog in one gulp! MORAL OF THE STORY: IT IS NOT WISE TO BOAST LOUDLY.